Question 1. Based on the facts and business model adopted by Sanghvi Movers Limited (“SML” or “Applicant” or “the Company”,) under the GST regime as discussed below in detail, whether movement of tyre mounted cranes or crawler cranes from one GST registered office of SML to another registered office of SML for further supply on hire charges to customers would be treated as “taxable supply” under GST law or whether GST would not be leviable on the said movement as per the clarification issued by the CBEC vide Circular No. 21/21/2017-CGST read with Circular No. 1/1 /2017-IGST? Answer: – Answered in Affirmative. Further circular No. 21/21/2017-IGST which exempts from tax interstate movement of rigs, tools, spares, and all goods on wheels [ like cranes ] where interstate movement of such goods is not for further supply of same goods is not applicable to the facts of present transaction as in the present case interstate movement of goods from SML HO in Maharashtra to SML branches in other states is for further supply of goods on hire. Question.2. In the present situation and under the given facts, if GST is payable on the aforesaid transaction, whether the recipient office of SML duly registered under GST receiving such cranes for further supply on hire charges would be eligible to avail input tax credit of GST charged? Answer: – Question is not answered by this authority as the applicant is not the proper person to raise this question. Question 3. In case when a tyre-mounted crane or crawler crane is moved from one GST registered office of SML to another registered office of SML only for upkeepment and maintenance purpose, without any further supply to unrelated customers, whether such movement of crane would be treated as “taxable supply” under the GST law or can it be said that it would not tantamount to “supply” as per clarification issued by the CBEC vide Circular No. 21/21/2017-CGST read with Circular No. 1/1/2017-IGST? Answer: – Answered in the negative. The impugned movement as per circular 21/21/2017-GST would be neither as a supply of goods nor supply of service. However, tax is leviable on repairs and maintenance done for such goods. Question 4. If the transaction stated above in question 1 is liable to tax, whether GST would be payable only on the movement of tyre-mounted cranes being goods on wheels or GST would also be payable on movement of both types of cranes (i.e. tyre-mounted cranes and crawler cranes)? Answer: – GST would be payable on the movement of both type of cranes i.e. tyre mounted cranes and crawler cranes. Question 5. What should be the value under section 15 of the Central Goods and Services Tax Act, 2017 (CGST Act) and the rules made thereunder for discharging applicable GST on movement of cranes from one GST registered office to another registered office in case the said movement is considered to be a taxable supply? Answer: – The value for the purpose of section 15 where the recipient branch office in other state is eligible for full input tax credit would be the value declared in the invoice as open market value of the services for the purpose of levy of tax and alternatively and amount equivalent to 90% of the price charged for the supply of goods of like, kind and quality by the recipient to his customer. In short there is no impropriety in the appellant considering 95% of the value charged by SML branches to the customer of the branches as value of supply for discharging GST liability. 1. Based on the facts and business model adopted by Sanghvi Movers Limited (“SML” or “Applicant” or “the Company”/ under the GST regime as discussed below in detail, whether movement of tyre mounted cranes or crawler cranes from one GST registered office of SML to another registered office of SML for further supply on hire charges to customers would be treated as “taxable supply” under GST law or whether GST would not be leviable on the said movement as per the clarification issued by the CBEC vide Circular No. 21/ 21/ 2017 – CGST read with Circular No. 1/1/ 2017 – IGST? 2. In the present situation and under the given facts, if GST is payable on the aforesaid transaction, whether the recipient office of SML duly registered under GST receiving such cranes for further supply on hire charges would be eligible to avail input tax credit of GST charged? 3. In case when a tyre-mounted crane or crawler crane is moved from one GST registered office of SML to another registered office of SML only for upkeepment and maintenance purpose, without any further supply to unrelated customers, whether such movement of crane would be treated as “taxable supply” under the GST law or can it be said that it would not tantamount to “supply” as per clarification issued by the CBEC vide Circular No. 21/21/2017-CGST read with Circular No. 1/1/2017-IGST? 4. If the transaction stated above in question 1 is liable to tax, whether GST would be payable only on the movement of tyre-mounted cranes being goods on wheels or GST would also be payable on movement of both types of cranes (i.e. tyre-mounted cranes and crawler cranes)? 5. What should be the value under section 15 of the Central Goods and Services Tax Act, 2017 (CGST Act) and the rules made thereunder for discharging applicable GST on movement of cranes from one GST registered office to another registered office in case the said movement is considered to be a taxable supply? 6. At the outset, we would like to make it clear that the provisions of both the CGST Act and the MGST Act are the same except for certain provisions. Therefore, unless a mention is specificaIly made to such dissimilar provisions, a reference to the CGST Act would also mean a reference to the same provision under the MGST Act. Further to the earlier, henceforth for the purposes of this Advance Ruling, a reference to such a similar provision under the CGST Act/MGST Act would be mentioned as being under the “GST Act”. 1. SML is a public limited company incorporated in the year 1989 under the provisions of the Companies Act, 1956. SML is engaged in the business of providing medium-sized heavy-duty cranes on rental/ lease/ hire basis to its clients without transferring the right to use the cranes. SML has pan-India presence and cranes are deployed across India as per the requirements of customers. 2. SML operates these cranes on wet lease basis (own, operate and maintain) and provides the entire operating crew, such as crane operators, riggers, helpers, mechanicals, engineers, etc., whenever a crane is given on rent. SML has a large fleet of more than 400 cranes ranging from 40 MT to 800 MT lifting capacity. All cranes have been imported from various countries such as USA, Germany, Japan, Singapore, China, etc. 3. SML owns two types of cranes, viz. i) Crawler cranes (they are fitted with crawler tracks/ chain belts, as seen on military tanks). These cranes cannot be plied on normal roads, and therefore, do not require any registration from the Regional Transport Office (RTO). ii) Tyre-mounted hydraulic cranes ply on the road and require RTO registration. 4. The cost of these cranes is significantly high and their average economic life ranges from 25 to 35 years. These cranes are moved/ transported on trailers, from one location to another, in knock down condition. 5. As the movement of cranes involves significant time and cost, SML has set up various branches (“SML branch offices”) across India at strategic locations to minimize transportation time and costs. II. Under GST, SML has obtained registration for 10 locations across India, including its head office (“SML Maharashtra”) located in Pune, Maharashtra. 6. SML has multiple offices across India from where it undertakes business activities. At present, SML branch offices receive enquiries from various customers for supply of cranes on hire charges. SML branch offices negotiate with customers and receive final work orders from customers. 7. The title and ownership of all the different types of cranes along with their components vest with SML Maharashtra. Therefore, on receipt of the final work order, all the SML branch offices in turn raise internal work orders on SML Maharashtra to provide requisite cranes on hire charges along with appropriate support and assistance to various customers across India. 8. with the introduction of GST with effect from 1 July, 2017, all the branches of a single legal person located in different States are treated as distinct person and any supply of taxable goods/ services between distinct persons with or without consideration, is subject to applicable GST. Thus, under GST, inter-State branch transactions involving services have been brought under the ambit of tax. As a result, SML had to relook at its existing business model and the way it undertakes transactions both internally and externally with customers. 9. In order to comply with the provisions of GST law and ensure operational feasibility, SML has modified its business model. SML Maharashtra has entered into a formal service arrangement with all SML branch offices by entering into a Memorandum of Understanding (MOU), wherein SML Maharashtra has agreed to provide cranes and crane components to all SML branch offices on hire charges. As part of the service arrangement, whenever SML branch offices receive a final work order from their customers for providing cranes on hire charges, the said SML branch offices will in turn raise an internal work order on SML Maharashtra for providing the requested cranes on hire charges to them. 10. Thus, for each final work order received by SML branch offices from customers, an internal work order is raised by SML branch offices on SML Maharashtra, wherein such class/ type of crane, as required by customers, is provided on hire charges by SML Maharashtra to the respective SML branch offices, which in turn sub-hire them to the ultimate customers. 11. Thus, as and when customers raise final work orders on respective SML branch offices for supply of crane on hire charges, the SML branch offices in turn raise back-to-back internal work orders on SML Maharashtra. 12. The crane, along with its components, is taken on hire from SML Maharashtra by SML branch offices for further sub-hiring for a term based on the period of underlying final work order received by respective SML branch offices from their customers. 13. On receipt of internal work order from respective SML branch offices, SML Maharashtra transports the crane and its components to the customer’s location/ project location on the instructions of SML branch offices. 14. For brevity and clarity of facts, an illustration of the transaction flow involved is provided below. 15. for each type of crane given on hire charges, the crane operator maintains a separate monthly log sheet at the customer/ project location, wherein the daily and hourly details of crane usage and idle time are maintained, based on which the monthly service invoice is raised by SML branch offices on respective customers. Further, an invoice from SML Maharashtra is issued to the SML branch office and the value considered for levying GST is approximately 95% of the value charged to the customer by the SML branch, following the principle under Rule 28 of the Central Goods and Services Tax Rules, 2017 (“CGST Rules”) read with section 15 of CGST Act. 16. In most cases, cranes are moved from one GST registered office of SML to another registered office when there is an underlying work order received by the recipient branch office. However, in some cases, it may happen that the crane is moved from one registered branch office to another registered branch office for temporary upkeepment and maintenance purposes. 17. As the title and ownership of all cranes vest with SML Maharashtra; therefore, for such upkeepment and maintenance activity, the respective SML branch office providing such services levies charges for the same on SML Maharashtra on a monthly basis, depending upon the type and capacity of the crane. Further, the applicable GST is discharged on said service by the respective SML branch office and SML Maharashtra in turn avails input tax credit of the same. 18. Considering that each branch office is distinct person as per section 25(4) of CGST Act, it is imperative to have contractual arrangement in place between all the SML branches documenting service arrangement and consideration for such services. Accordingly, SML Maharashtra and SML branch offices have agreed to formally enter into a service agreement through an MOU, whereby SML Maharashtra shall provide different types of cranes and crane components to all SML branch offices on hire charges as per the requirement of each SML branch office. 19. The ownership and title of cranes and crane components shall vest with SML Maharashtra. However, as and when any SML branch offices receive the final work order from their customers for supply of crane on hire charges, the said crane shall be provided by SML Maharashtra to SML branch offices for further sub-hiring purpose. Method of invoicing- As per the monthly log sheet, SML branch offices raise invoices on their respective customers and on the basis of the same, SML Maharashtra in turn raises taxable invoice on the respective SML branch offices. Valuation adopted- SML Maharashtra recovers hire charges equivalent to approximately 95% of hire charges recovered by SML branch offices from their respective customers and discharges GST as applicable on the said value. 20. As per section 12(2) of Integrated Goods and Services Tax Act, 2017 (“IGST Act”), the place of supply of services of leasing/ hire/ renting of crane to a registered person shall be the location of such registered person. Therefore, in the said transaction, as the place of supply falls outside Maharashtra, i.e., the location of registered SML branch offices, SML Maharashtra discharges IGST on the value of hire charges recovered from other SML branch offices treating the same as inter-State supply of service. 21. As per the second proviso to section 16(2) of the CGST Act, the input tax credit availed is required to be reversed in case payment is not made to the vendor within 180 days. 22. Further, as per Rule 37 of the CGST Rules, 2017, in case of supplies made between distinct persons as specified under section 25(4) of the CGST Act, it shall be deemed that the payment has been made and no input tax credit reversal is required to be made for non-payment of consideration. Hence, the recipient SML branch offices can avail credit of IGST charged by SML Maharashtra on the value of hire charges charged on the invoice. 23. The GST Council in its 23rd meeting held on 10 November, 2017 clarified that inter-State movement of goods like rigs, tools, spares and goods on wheels like cranes, not being in the course of furtherance of supply of such goods, does not constitute supply. This clarification was issued to give major compliance relief to industry, as there are frequent inter-State movement of such kind in the course of providing services to customers or for the purposes of getting such goods repaired or refurbished or for any self-use. Service provided using such goods would in any case attract applicable tax. 24. In order to give effect to the recommendations of the GST Council, the CBEC issued Circular No. 21/21/2017-CGST dated 22 November, 2017. As per the said Circular No. 21/21/2017-CGST dated 22 November, 2017 read with Circular No. 1/1/2017-IGST dated 7 July, 2017, the inter-State movement of rigs, tools and spares, and all goods on wheels [like cranes] between distinct persons, as specified in section 25(4) of the CGST Act shall be treated neither as supply of goods or supply of service, except in cases where movement of such goods is for further supply of the same goods. 25. As per the GST law, the term “supply” includes transaction of leasing/ hire/ renting of goods. In addition, as per section 25(4) of the CGST Act read with Schedule I of the CGST Act, any transaction between inter-State branch offices of one legal entity made with or without consideration shall be liable to tax and applicable GST is required to be paid on the value of such transactions. 26. In the leasing industry, capital goods such as cranes are generally moved from one state to another between various branch offices of the same legal entity for providing the said capital goods on hire or for undertaking repairs and maintenance work. However, as a result of the afore stated provisions under the GST, each and every movement of such capital goods between distinct persons was subject to tax i.e., the movement of goods between inter-State branch offices was being subjected to tax, thereby causing undue hardship and compliance burden to the leasing industry. 27. Hence, to provide consequential relief to the leasing industry in general, the Central Government vide aforesaid Circular has clarified that only such movement of goods that would be further supplied by way of sale, transfer, barter, exchange, license, rental, lease or disposal made or agreed to be made would be treated as taxable supply and subjected to GST. 28. Further, the said Circular also clarifies that no GST would be levied in case such goods are moved for repairs and maintenance activity. However, applicable GST would be leviable on the value of repairs and maintenance carried out. 29. Against the aforesaid background and facts and our understanding of various provisions and clarifications issued by CBEC, we desire to obtain a ruling on questions as stated above, and hereby, submit this application before the Hon’ble Authority of Advance Ruling. 30. The Applicant craves leaves to submit such further facts at or before the hearing of the application as may be relevant. Qu. 1). 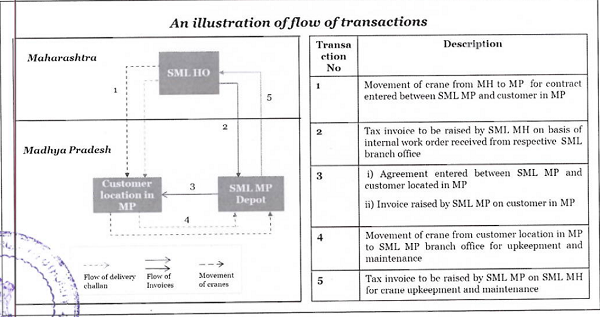 Based on the facts and business model adopted by Sanghvi Movers Limited (“SML”_or_ “Applicant”_or_ “the Company”_) under the GST regime as discussed below in detail, whether movement of tyre mounted cranes or crawler cranes from one GST registered office of SML to another registered office of SML for further supply on hire charges to customers would be treated as _”taxable supply”_ under GST law or whether GST would not be leviable on the said movement as per the clarification issued by the CBEC vide Circular No. 21/21/2017-CGSTread with Circular No. 1/1/2017-IGST? Answer: – As per section 24(1) (i) of the CGST act, persons making any inter-state taxable supply shall be compulsorily required to be registered under the CGST Act. As per section 7(i)(a) of the CGST Act, supply includes all forms of supply of goods or services or both such as sale, transfer, barter, exchange, license, rental, lease or disposal made or agreed to be made for a consideration by person in the course or furtherance of business. As per section 25(4) of the CGST Act, a person who has obtained or is required to obtain more than one registration. As per section 25(4) of the CGST Act read with Schedule I of the CGST Act, the movement of cranes from SML Maharashtra to SML branch offices for further supply to unrelated customers is a taxable supply of service and SML Maharashtra is liable to discharge IGST on such movement. As per the said Circular No. 21/21/2017-CGST dated 22 November, 2017 read with Circular No. 1/1/2017-IGST, dated 7 July, 2017, the inter-State movement of rigs, tools and spare, and all goods on wheel [like cranes] between distinct person as specified in section 25(4) of the CGST Act for carrying goods or passengers or both; or for repairs and maintenance, etc., shall be treated neither as supply of goods or supply of service, except in cases where movement of such goods is for further supply of the same goods. This Circular is not applicable in this case because if cranes moved by SML Maharashtra based on the internal work order received from SML branch offices, against the receipt of final work orders from unrelated customers, such movement shall be treated as separate supply of service provided by SML Maharashtra to SML branch offices. As per my opinion, the movement of cranes from one GST registered office to another branch office of M/s Sanghvi Movers Ltd for further supply on hire charges to customers is treated as “taxable supply” under GST. Qu. 2. In the present situation and under the given facts, if GST is payable on the aforesaid transaction, whether the recipient office of SML duly registered under GST receiving such cranes for further supply on hire charges would be eligible to avail input tax credit of GST charged? d. Tax returns have been furnished. Further, as per second proviso to Rule 37 of the CGST Act, input tax credit shall be eligible subject to payment of the total value of supply along with tax amount to the supplier within 180 days from the invoice date. Question. 3. In case when a tyre mounted crane or crawler crane is moved from one GST registered office of SML to another registered office of SML only for upkeepment and maintenance purpose, without any further supply to unrelated customers, whether such movement of crane would be treated as “‘taxable supply”‘ under the GST law or can it be said that it would not tantamount to “‘supply”‘ as per clarification issued by the CBEC vide Circular No. 21/21/2017-CGST read with Circular No. 1/1/2017-IGST? Answer:- As per Circular No. 21/21/2017-CGST read with Circular No. 1/1/2017-IGST , inter-state movement of goods on wheels such as cranes between distinct person as specified in section 25(4) of the CGST Act, is not leviable to IGST if the cranes are moved for internal use for carrying any goods, or for repairs and maintenance, etc., except in cases where such movement is for further supply of the said cranes on hire charges. Further, the registered branch office proving the upkeepment and maintenance service, charges consideration for the same from SML Maharashtra and levies applicable GST on the same. Thus, as the activity of upkeepment and maintenance is already taxed by SML branch offices, the movement of cranes from one registered branch office to another for undertaking repairs and maintenance activity should not be liable to tax under GST, as it would result in double taxation of a single transaction. As the cranes are moved from one GST registered office to another for upkeepment and maintenance activity, which in itself is a taxable service, the said movement of cranes should not attract levy of GST, as it would result in double taxation of a single transaction. Qu. 4. If the transaction stated above in question 1 is liable to tax, whether GST would be payable only on the movement of tyre mounted cranes being goods on wheels or GST would also be payable on movement of both types of cranes (i.e. tyre, mounted cranes and crawler cranes)? Answer:- The transaction / Movement of goods i. e. tyre mounted cranes and crawler cranes from SML Maharashtra to SML branch for further supply to on hire charges to customers is liable for tax under GST Act. As per Circular No. 21/21/2017 the inter-state movement of all goods on wheel (cranes on wheel) between distinct person for further supply of the same good is liable to under GST Act. Hence in this case GST is applicable. Qu. 5. What should be the value under Section 15 of the Central Goods and Services Tax Act, 2017 (:CGST Act’) and the rules made thereunder for discharging applicable GST on movement of cranes from one GST registered office to another registered office in case the said movement is considered to be a taxable supply? Answer :- Section 15- The value of a supply of goods or service or both shall be the transaction value, which is the price actually paid or payable for the said supply of goods or service or both where the supplier and the recipient are not related and the price is the sole consideration for the supply. The value of supply include- any taxes, duties, cases, fees and charges levied under any law for the time. As per my opinion, in such a case of supply of Goods and services between deemed district persons, the value of goods or services determined as open market value. The case was taken up for preliminary hearing on DT. 10.04.2018, with respect to admission or rejection of the application when Sh. Nitin Vijaivergia, C.A. along with Sh. Vipin Bang and Sh. Abhijit Savarkar, G.M. Taxation appeared and made contentions as per details in their ARA. The jurisdictional officer, Sh. B K. Shedge, Dy. Commissioner of S.T. (PUN-VAT-E-810) Pune appeared and stated that they would be making submissions in due course. The application was admitted and final Hearing was held on 16.05.2018, Sh. Nitin Vijaivergia, C.A. along with Sh. Vipin Bang and Sh. Abhijit Savarkar, G.M. Taxation appeared made written submissions. The jurisdictional officer, Sh. B K. Shedge, Dy. Commissioner of S.T. (PUN-VAT-E-810) Pune appeared and made written submissions. We have gone through the facts of the case and various written submissions made by the applicant and jurisdictional officer during the course of the proceeding before us. We find that the Applicant Sanghavi Mover Ltd (herein referred as SML) is a Public Limited Company incorporated under the provision of the Company Act, 1956 holding GST registration number (‘GSTN’) 27AACCS3775K1ZX with effect from 1st July 2017. SML is engaged in the business of providing medium-sized heavy-duty cranes on rental/lease/hire basis to its clients without transferring the right to use the cranes. SML has pan-India presence and cranes are deployed across India as per the requirements of customers. Its head office (‘SML HO Maharashtra’) is located in Pune, Maharashtra. SML operated these cranes on wet lease basis ( own/operate and maintain ) and provides the entire operation crew, such as crane operators, riggers/helpers, mechanicals, engineers, etc., whenever a crane is given on rent. SML owns two types of cranes namely crawler cranes and Tyre-mounted hydraulic cranes. Applicant has stated in details about the goods involved in this transaction but what is significant for present purpose is to understand the business model. As per the model as reproduced in vertabum above applicants Branch offices at different locations negotiate with the customer for supply of cranes on hire charges and receive final work order. The applicant’s Branch on receipt of final work order in turn raise internal work order on Head office to provide crane on hire charges along with appropriate support and assistance. However, the title and ownership of all different types of cranes along with components vest with SML HO. With the introduction of GST wef 1 July, 2017 and in order to comply with the provisions of GST and to ensure operational feasibility, SML HO in Maharashtra ( In short SML HO ) has modified its business model by entering into a Memorandum of Understanding (MOU) with all branch offices located all over India. This is nothing but a formal service arrangement between HO and branch offices. As a part of service arrangement, whenever branch offices receive a final work order from their customers for providing cranes on hire, the SML branch office will raise an internal work order on SML HO for providing requested crane on hire. In order to comply with as per the final work order the SMLHO transports the crane and its components to the customer’s location/ project location on the instruction of SML branch office. This type of transaction constitute core business of the applicant. However, in some cases, the crane is moved from one registered branch office to another registered branch office for temporary unkeepment and maintenance purpose. In any case, however, the ownership and title to the crane vests with HO. Whenever crane moves from SML HO to SML branch office for further supply on hire, the invoice is issued by SML HO to SML branch office and the value considered for levying GST is approximately 95% of the value charged to customer by the branch. Whereas when crane move from one registered location to another registered location for upkeepment and maintenance activity the respective branch office providing such services levies charges on H.O. along with applicable rate of GST. Que: 1 Based on the facts and business model adopted by Sanghvi Movers Limited (“SML” or “Applicant” or “the Company”) under the GST regime as discussed below in detail, whether movement of tyre mounted cranes or crawler cranes from one GST registered office of SML to another registered office of SML for further supply on hire charges to customers would be treated as “taxable supply” under GST law or whether GST would not be leviable on the said movement as per the clarification issued by the_CBEC vide Circular No. 21/21/2017-CGST read with Circular No. 1/1/2017-IGST? From the co-joint reading of section 7 and schedule – II applicant’s activity of providing crane on hire is nothing but transfer of right in cranes without the transfer of title thereof and is therefore a is suppIy of service. The next issue raised by the applicant for our consideration is under claim that all the branches located in different state are of single legal person and as such the movement of crane for supply on hire from HO in Maharashtra to branch office in another state would not be leviable to tax .under the GST as per the clarification issued by CBEC vide circular NO. 21/21/2017-GST r/w Circular No. 01/01/2017. As per general understanding, the HO and branches of one legal entity have no separate existence. However as per section25 (4) of the GST where a person who has obtained or is required to obtain more than one registration, each such registration is treated as distinct person. Section 25(4): A person who has obtained or is required to obtain more than one registration, whether in one State or Union territory or more than one State or Union territory shall, in respect of each such registration, be treated as distinct persons for the purposes of this Act. The registration in GST is Pan based and state specific. Every supplier has to register in each state from where he effects supply. In short, a business entity having its branches in multiple state will have to take separate state wise registration for the branches located in different states. And if we read this provision with activities to be treated as supply even if made without consideration as mentioned in Schedule-I of the GST Act, we find that supply of goods or services or both between related person or distinct person without any consideration, when made in the course or furtherance of business is also supply as contemplated in section 7 of the GST Act. Further we find that this supply is not exempt from tax under the GST Act and hence is a taxable supply. In this case, undisputedly the supply is between two different taxable territory meaning thereby between two states and as per section 7 (3) the of IGST Act, the supply is in the course of interstate trade or commerce. And as per section 5 (1) of the IGST Act said interstate supply is taxable under the provisions of the IGST in the hand of the applicant. Therefore, we conclude that in the present case supply of cranes, cranes components and trailers on lease/hire charges by the SML HO to SML branches in TN and other state constitute interstate taxable supply of service between two distinct person and liable to pay tax under the provisions of IGST Act. Further we find that the issue of IGST exemption on interstate movement of various modes of conveyance between two distinct person as specified in Section 25(4) of the GST Act, 2017 for carrying goods or passengers or both; or for repair or maintenance except in cases where such movement is for further supply of the same conveyance was examined by the Board vide circular NO. 1/1/2017 DT. 7.7.2017. And it was clarified that such movement may not be treated as supply and therefore would not be leviable to IGST. Further the Board in order to give effect to the discussions held in GST councils meeting held on 10 th November 2017 pertaining to interstate movement of rigs, tools and spares, and all goods on wheels [like cranes] issued circular 21/21/2017-GST and clarified that the Circular No. 1/1/2017-IGST shall mutatis mutandis apply to interstate movement of such goods, and except in cases where movement of such goods is for further supply of same goods; such interstate movement shall be treated ‘neither as a supply of goods or supply of service’ and consequently no IGST would be applicable on such movement . It is further reiterated that applicable CGST/SGST/IGST, as the case may be, is leviable on repairs and maintenance done for such goods. In view of these two circulars we have to ascertain whether the clarification is applicable to the facts of the case i.e. cranes supplied/provided by the applicant namely – crawler cranes (they are fitted with crawler tracks/chain belts, as seen on military tanks) and Tyre mounted hydraulic cranes that ply on road. Applicant’s case is covered by second circular and as per this circular what is exempted is all goods on wheel [like crane]. As regards Tyre mounted crane there shall be no doubt as said crane are on wheel. The issue before us is whether the crawler crane is covered by the expression goods on wheel (like crane used in the second circular) for this purpose we have to understand the meaning of word “like” which is not defined in the act. We may now take assistance of dictionary meaning of the said word to arrive at certain conclusion. used with reference to a person or thing of the same kind as another, a thing or things of the same kind (often used to express surprise or for emphasis). (of a person or thing) having similar qualities or characteristics to another person or thing. Considering the intent of the circular and meaning of the word ‘like’ as per dictionary we have no hesitation to conclude that both types of cranes are covered by the expression ‘all goods on wheel [like crane] mentioned in the second circular as both types of cranes – Tyre mounted cranes and crawler cranes are used to perform same kind of work i.e. mechanical direction job. As per the said circular interstate movement of cranes except in cases where movement of such goods is for further supply of same goods, shall be treated ‘neither supply of goods or supply of service’. The reliance by the applicant on this circular to claim interstate movement of cranes as exempt from levy of IGST is misplaced as the cranes moves form SML HO Maharashtra to SML branch in another state for further supply of same cranes. For above deliberation we conclude that IGST would be leviable on the interstate movement of both type of cranes from SML HO to SML branch offices registered in another state for further supply on hire charges to customer and thus the circular 21/21/2017-IGST is not applicable to the facts of the present transaction. Que: 2 In the present situation and under the given facts, if GST is payable on the aforesaid transaction, whether the recipient office of SML duly registered under GST receiving such cranes for further supply on hire charges would be eligible to avail input tax credit of GST charged? This question is in respect of recipient office of SML registered under the GST Act in a taxable territory other than Maharashtra state. We are , therefore, of the opinion that applicant is not proper person to raise this question and therefore we are not expressing our opinion on this question. Que: 3. In case when a tyre-mounted crane or crawler crane is moved from one GST registered ) office of SML to another registered office of SML only for upkeepment and maintenance purpose, without any further supply to unrelated customers, whether such movement of crane would be treated as “taxable supply” under the GST law or can it be said that it would not tantamount to “supply” as per clarification issued by the CBEC vide Circular No. 21/21/2017-CGST read with Circular No. 1/1/2017-IGST? At the outset with regard to this question we consider only that interstate movement of tyre mounted crane or crawler crane wherein the crane is moved from registered office of SML in the state of Maharashtra to another registered office of SML in other state and the movement is solely for the purpose of upkeepment and maintenance purpose and not for further supply of the crane on hire charges. We find that the situation as mentioned above is squarely covered by the clarification issued by Tax Research Unit vide circular 21/21/2017-GST DT. 22nd November, 2017. As such the interstate movement of cranes is neither a supply of goods nor supply of services and consequently no IGST would be applicable on such movement. However, tax is leviable on repairs and maintenance done for such goods. Que: 4 If the transaction stated above in question 1 is liable to tax, whether GST would be payble only on the movement of tyre-mounted cranes being goods on wheels or GST would also be payable on movement of both types of cranes (i.e. tyre-mounted cranes and crawler cranes? We have already given answer in respect of question No.1 that both types of cranes i.e. tyre-mounted cranes and crawler cranes are covered by the expression ‘all goods on wheel [like crane]’ used in the circular 21/21/2017-GST and as such GST would be payable on the interstate movement of both types of cranes from SML HO Maharashtra to SML branch office in other state for further supply of such cranes on hire charges. Que: 5 What should be the value under section 15 of the Central Goods and Services Tax Act, 2017 (CGST Act) and the rules made thereunder for discharging applicable GST on movement of cranes from one GST registered office to another registered office in case the said movement is considered to be a taxable supply? We have already stated and held that the transaction between SML HO and SML branch office is supply having regards to Section 25(4) and Schedule I of the GST Act. As per section 25(4) of the GST Act, as mentioned above, the SML HO and SML Branches are distinct persons for the purpose of this Act and as per schedule-I supply even if made without any consideration between two distinct persons as specified in section 25(4) is also supply when made in the course or furtherance of business. Applicant has explained the method of invoicing in his submissions. As per the method SML branch office on the basis of monthly log sheet raise invoices on their respective customer and on the basis of same, SML Maharashtra that is applicant in turn raises taxable invoice on the respective SML branch offices. SML Maharashtra recovers hire charges equivalent to 95% of hire charges recovered by SML branch offices from their respective customers. Applicant discharges GST as applicable on the said 95% value. On this factual matrix we have been called upon to answer the impugned question. As per section 15 of the GST Act, the value of supply of goods or supply of services or both shall be transaction value that is actually price paid or payable provided that the supplier and recipient are not related person and the price is the sole consideration. Rule 28:-Value of supply of goods or services or both between distinct or related persons, other than through an agent. Provided further that where the recipient is eligible for full input tax credit, the value declared in the invoice shall be deemed to be the open market value of the goods or services. In the present transaction of supply we find that value considered by the applicant for levying GST is approximately 95% of the value charged to the customer by the SML Branch. The determination value of supply as aforesaid by the applicant is as per the first proviso to Rule 28 of the GST Rules. We also find from the submission made by the applicant and the terms of MOU that the supply of cranes on hire by SML Maharashtra to SML Branches is for further supply of such crane on hire by the SML Branches to customers. As such we presume that SML Branches are eligible for full input tax credit. In such situation and as per Second proviso to Rule 28 of the GST Rules, the value declared in the invoice shall be deemed to be open market value. In view of this we do not find any irregularity in the value of supply considered by the applicant for levying GST which is approximately 95% of the value charged by SML branches to the customer of the branches. Question 1. Based on the facts and business model adopted by Sanghvi Movers Limited (“SML” or “Applicant” or “the Company”,) under the GST regime as discussed below in detail, whether movement of tyre mounted cranes or crawler cranes from one GST registered office of SML to another registered office of SML for further supply on hire charges to customers would be treated as “taxable supply” under GST law or whether GST would not be leviable on the said movement as per the clarification issued by the CBEC vide Circular No. 21/21/2017-CGST read with Circular No. 1/1/2017-IGST? Answer: – Answered in Affirmative. Further circular No. 21/21/2017 – IGST which exempts from tax interstate movement of rigs, tools, spares, and all goods on wheels [ like cranes ] where interstate movement of such goods is not for further supply of same goods is not applicable to the facts of present transaction as in the present case interstate movement of goods from SML HO in Maharashtra to SML branches in other states is for further supply of goods on hire.